So the new kickstarter campaign for World of Warcraft Dev Diary by Johh Staats is approaching, and with it, some Q&A and interviews are arriving. It covers certain things I spoke of while on discord (the undead's identity being in flux for long, Metzen wishing for Lordaeron Ruins to be the capital, the Undercity was born thanks to the art team and their wishes, the naga and the demons planned as playable at a certain point, etc), but there are also other tidbits, like the South Seas originally being planned for the first expansion. An interesting tidbit; there's a mention of six planned Ream vs. Realm battlefields. This once again confirms my assertion that Classic/Vanilla was originally supposed to be about an open war between the Horde and the Alliance, as mentioned in the manual, several (human and dwarf) intros, the cinematic, and early questing, and that they only retroactively changed it to a cold war after much of this content was scrapped. Staats answered some more questions on twitter to me through DMs, as well as some through public tweets. What I can share. 1) The split into two hard factions indeed came only after the team played Dark Age of Camelot (late 2001/early 2002). Classic was from that point planned to be an RvR heavy game featuring an open conflict between the Horde and the Alliance. Which is in striking contrast to the previous version where they were not even sure they'd include Player versus Player at all. 2) The very reason why Kalimdor ended so big from early concepts/Warcraft III maps (map1, map2) is that the designers considered it better design to spread cool places evenly. This aligns with what Staats mentioned in the interview I've posted, the designers often moved things from their original location when they needed to fill empty spaces or needed to make an area less crowded, despite the objections of the lore team. 3) The team simply did not have time to make all the human nations represented in-game. Plus they thought having so many would make lore too hard to understand for the newcomers. 4) World of Warcraft nearly bankrupted Blizzard, on all fronts. What he says about what was cut from Karazhan (in the end, going to a platform on open universe and then teleporting to an asteroid full of demons) seems to match what was done in Legion for Upper Karazhan. Also, the giant octopus old god structure seems to be what we see today in Stormsong Valley. I already had the impression what WoD/Legion was WoW 2.0 and these tidbits cement my thoughts. After having learned of their Realm vs. Realm plans for Classic and how the cold war was at that time supposed to be hot (clear to anyone who had paid any attention to the manual/early questing) until they scrapped the planned RvR content, Battle for Azeroth with its full on faction war and no definite world ending threat, warfronts, Kul Tiras and Tol Dagor (Tol Dagor seems like a reuse of their old ideas for Tol Barad), it feels Battle for Azeroth is also Classic 2.0, perhaps the most of them all. 1- MoP was exploration and wonder. I even remember some developer interviews talking about trying to get the feeling of exploration from vanilla. 2- WoD, we visited another world. It's even the same, but not quite the same, otherworld. 3- Legion, we vanquished a major enemy force of the past. 4- BfA is now, again, breaking and revamping the world. So, I'd guess the circle begins anew next expansion. Or I am just looking too much into it and trying to find patterns that do not exist. - Major enemy from the past - the Shadowlands at last? - Breaking and revamping the world - my Ice Age concept. The kickstarter for the World of Warcraft Development Diary is up now. Staats is doing an AMA in honor of the kickstarter: some of the most interesting details (from what I've read so far). -The Karazhan Crypts were originally a dungeon. They got cut because Blizzard felt there were too many dungeons in vanilla, there wouldn't be enough item upgrades to fit another in. -The zone/raid he most regrets being cut was Dragon Isles. It was cut because the Old God temple looked amazing, but was too cramped and narrow inside to be fun to use as a raid. -Mount Hyjal was cut as a leveling zone in vanilla because Blizzard felt there were too many zones when the level cap was 60, this is also why Deadwind Pass had no quests in it. -The Caverns of Time dungeons took so long to get implemented because doing time travel in a fantasy setting is really hard. No matter how far back you go, everything still looks like the same time period. They tried a lot of different visual styles to indicate time travel (one being a giant time spire thing players would ascend to reach the past area of the particular instance) before getting the versions in BC. -The famous Emerald Dream zones in the files were cut because while the concept art looked amazing, the zones themselves looked "really stupid" to the developers and they couldn't make the Emerald Dream look interesting. Come to think of it, this is probably what they meant in that old interview saying there would never be an Emerald Dream expansion because it would look boring. -Player housing was going to be located in instanced districts of the capital cities called "neighborhoods." -One of the features Staats pitched in vanilla that got shot down was Guild Keeps. Big castles a guild would control with modular rooms that could be make the castle bigger and customized. They wouldn't be instanced or phased, there would be a set number of keeps out in the world that guilds would fight over the control of. Some things from the book I shared on the discord. 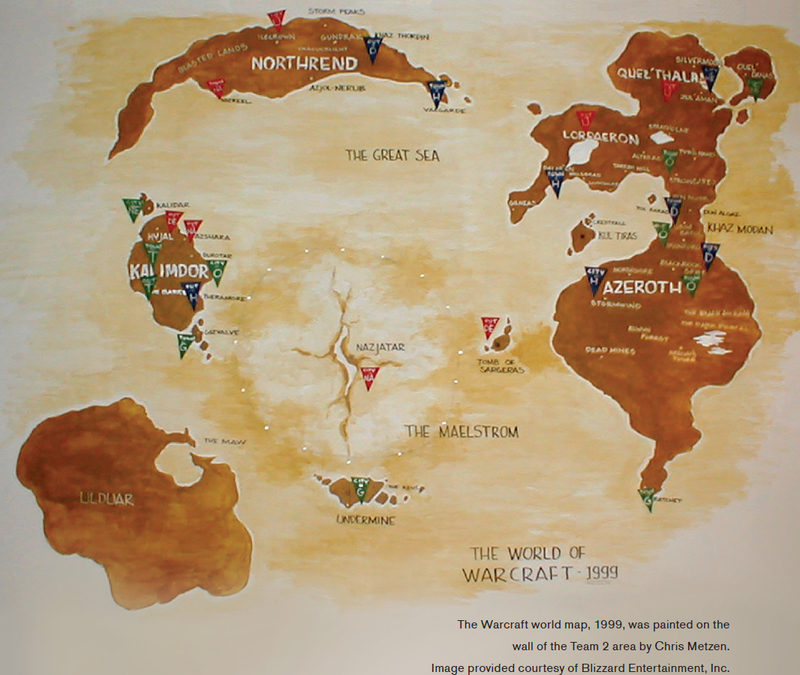 This is the original map created for Team 2 by Metzen in 1999, before the actual production started. Since I can't get a higher resolution picture from the book, here's the legend for anyone who finds it too hard to read. The triangles represent playable races and their major settlements/points of interest. O (orcs): Durotar, Blackrock Spire, Grim Batol, Stromgarde. T (tauren): Two settlements in the Barrens. G (goblins): Undermine, Ratchet, Gulfvalve/Gazvalve (?). NE (night elves): Kalidar, Quel'Danas. H (humans): Stormwind, Theramore, Dalaran, Valgarde. D (dwarves): Ironforge, Dun Modr/Dun Algaz, Khaz Thorde(i)n (Northrend). U (undead): Icecrown, Lordaeron, something in Quel'thalas. NA (Naga): Nazjatar, Azshara, Nazreel (?)(Northrend). 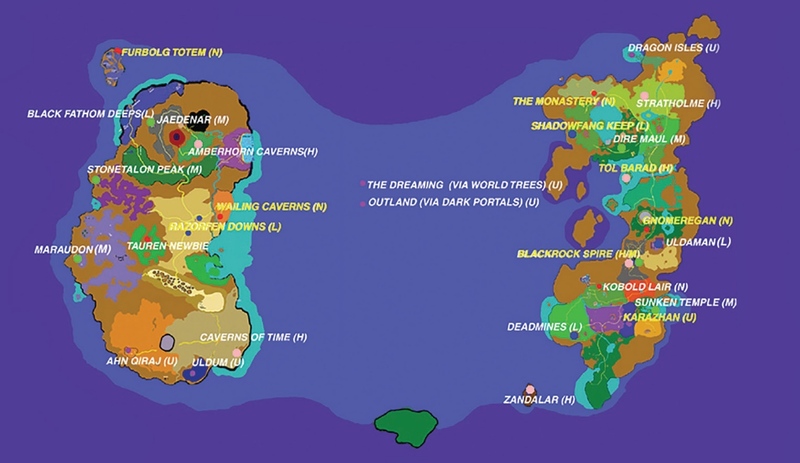 One has to remember that this map was created before the story of Warcraft III was set it stone and before they decided to feature two hard factions for the game (which happened in late 2001/early 2002 due to the success of Dark Age of Camelot). This is another map, from 2001. I features major dungeons planned at the time. The letters probably mean N (newbie) -> L (low) -> M (medium) -> H (hard) -> U (ultimate). 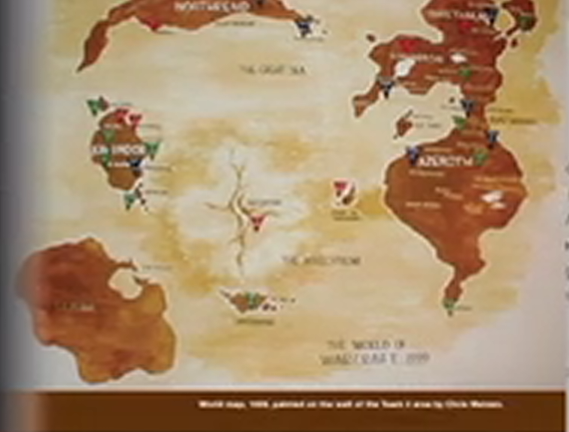 Note that this geography very closely resembles that of Warcraft III, it's from the early years of production when the teams for both games attempted to make it as close to each other as possible (Warcraft III's maps actually reflected many changes World of Warcraft induced to the geography due to gameplay design). More incoming as I have time on my hands. One more interesting thing. As you can see above, the demons, who were at the time conceptualized as a shapeshifting playable race as per the diary, were to have their own city at Hyjal. What is interesting is that apparently, Northern Kalimdor was to even have its own "Dark Portal, first at the "World Tree area", later in Azshara, then finally removed completely. It would seem that the original concept was for the demons to open another portal in Northern Kalimdor, and even after the defeat of their leaders (Archimonde) cling onto these territories, forcing the night elves to move to Kalidar. Very interesting stuff. Night elves on the Horde and an evil faction. This is not the first time we've heard this IIRC but still nice to learn more. It seems a night elf vs blood/high elf rivalry was planned from the very earliest start. With night elves in Quel'Danas which would surely annoy the high elves. But in the end it got flipped as the two elven groups switched factions in development. Well, this conceptual map comes from the times before the team decided to make the game factional, so I presume these colors do not represent factions per se. Wasn't the original idea to have soft factions? Like, Alliance and Horde existed, but players could mingle freely? The Night Elves are obviously meant to be Warcraft Dark Elves so getting put with the Horde isn't a stretch back then. I always thought that night elves fit in the Horde better both in theme and aesthetics. I suspect they were put in the Alliance for gameplay reasons (i.e. : give Alliance access to druids). I agree that Night Elves for Horde would have been potentially better fits and more interesting. I suspect it was also for the asymmetric symmetry of distributing Alliance and Horde races between the two continents (3-1 and 1-3). But there are a lot of other changes or obvious things that would have made more sense for classic WoW playable races (e.g., Horde goblins) than what we got (e.g., Undead for Horde). Incidentally, I do believe that Goblins were going to be the fourth Alliance race until fairly late in development of Classic. But I can't find the citation so I may be misremembering. Both Gnomes are Trolls were almost (but not quite) last minute additions. That's why they didn't have their own starting experiences until Cata and had to share with Dwarves and Orcs respectively. Last edited by Jon Targaryen; 11-24-2018 at 01:14 PM.. I'm surprised at the lack of Trolls. What about reputations (other factions)? I've always been intrigued by things like the Moro'gai and the lack of info about them. But we did not get free Gaul, we got romanised Gaul. The former would have been at home among the Germanic tribes, the latter would not. Especially not after the Horde killed one of the most important figures in the night elf pantheon. A point that often gets brought up are synergies between druidism and shamanism. And on paper I would agree that they are a good reason for placing the night elves on the Horde. In practice, however, shamans in Warcraft (especially orc and goblin shamans) only seem to care about nature beyond the elements once the its almost too late; once the elementals themselves are hammering the point that the complete disregard for nature also disrupts the balance and agitates the elements home. Especially not after the Horde killed one of the most important figures in the night elf pantheon. I think diplomacy could have explained that. All you really need would be to make the night elves feel more sympathy for the Horde than the Alliance. I wonder if it is possible for you to post more stuff like this, it's really exciting. And I am so hyped to watch for more. Hopefully won't be asking for too much. This map comes from 1999, Staats became part of the team only in 2000. Plus as he clarified to me, he was talking about the time when they decided to make the game bi-hard-factional. He also does not remember the high elves as a playable race, but this map makes them so. They were probably scrapped very early, before he joined the team, just like the demons, the naga, and eventually the goblins later on. The gnomes and the trolls were very late additions as well, hence no starting zones for them. As for the Cenarius argument, once again, timeline matter. This maps and early concepts predate Warcraft III by several years, and Cenarius' death in particular was quite a late addition to the story. If I recall correctly, that was only a rumor, and it is directly contradicted by the contents of the diary. The faction system has been really detrimental to the state of the story/world, that is even clearer now. I was specifically told that even The Frozen Throne had its story altered heavily to accommodate for the faction system in World of Warcraft and the placement of the races within in. Most notably, the subtle changes to the night elves from Reign of Chaos, the Forsaken storyline (Metzen came up with the Forsaken only after they decided to place playable undead on the Horde, formerly, they were to be the Scourge as you can see on the map), the blood elf storyline (The way I understood it, the blood/high elves were written out of the Alliance after they decided to make the night elves an Alliance race, as they did not want two elf races present at that time. Metzen was not particularly happy of either, and he was very strongly against the blood elves on the Horde in The Burning Crusade). Here is something I shared on the discord previously. A bunch of parts detailing Metzen’s role in Warcraft and generally the team’s stances on lore. I just meant that based on the direction Blizzard actually took with the night elves, making them a Horde race seems like a worse fit than making them an Alliance race to me. I was not really commenting on the map, but on the opinions of those who think that night elves are a better fit on the Horde.